FLIP halfway between its 28 minute flipping process from horizontal to vertical position. Image courtesy of Scripps Oceanography. FLIP once the transformation has taken place. 300m of the buoy is underwater and the protruding part is as tall as a five-storey building. FLIP before the transition begins. Image courtesy of Scripps Oceanography. The vessel is a 355ft long, spoon-shaped buoy, which can be flipped from horizontal to a 90° vertical position in the ocean by pumping 700t of seawater into the ‘handle’ end while flooding air into the ‘cradle’, causing it to rise out of the sea. The transition from horizontal to vertical positioning takes nearly 30 minutes, after which 300m of the buoy is submerged underwater, keeping the 700 long-ton mass steady, providing a stable research platform for underwater acoustics research. The vessel is imperviable to wave motion, thus allowing researchers to conduct a range of research activities including meteorology, geophysics, physical oceanography, marine mammal research, non-acoustic ASW and laser propagation experiments in a stable environment. Launched in June 1962 by The Gunderson Brothers Engineering Company of Portland, the FLIP was designed by two MPL scientists, Dr Fred Fisher and Dr Fred Spiess, to create a more stable space than a conventional research ship to study wave forms. The FLIP Maintenance Availability began at the Campbell Shipyard in December 1994 and was completed in January 1996. FLIP underwent constant dry dockings in 2001, 2003, 2006 and 2010, and completed 50 years of successful operations in 2012. The transformation from horizontal to vertical is one of the most impressive sights on the ocean. Because of the potential interference with the acoustic instruments, FLIP has no propulsion power, so has to be towed out to its operating area in the horizontal position at a speed of 7kt to 10kt. "FLIP’s unique design makes it the only vessel in the world capable of operating both horizontally and vertically." When positioned at the desired location at sea, the research vessel either drifts freely or is held in place using one or all of its three anchors, as required by the research project. The long, thin end of the buoy has special ballast tanks, which are then flooded with seawater, causing it to sink, while air tanks cause the other end of the buoy to rise. The protruding end is equivalent in height to a five-storey building. FLIP can operate equally well in shallow water and depths of more than 2,000 fathoms. A 30ft wave only causes FLIP to move three feet vertically in the water column. Although this is the size of wave the buoy was built to withstand, FLIP can cope with swells of up to 80ft. For FLIP to flip back to a horizontal position, air-compressed into eight tanks is used to push the seawater out of the ballast tanks. The submerged end of FLIP rises until the buoy is once again level with the water. FLIP’s unique design makes it the only vessel in the world capable of operating both horizontally and vertically. Scientific instruments are built sideways into the wall so that as the buoy flips, the instruments flip into a usable position as well. Most rooms on FLIP have two doors: one to use when horizontal and the other for when FLIP is vertical. Bunk beds, toilets and stoves are built on swivels and gimbals, so they turn with the buoy, but things that would not rotate so well, like sinks, are built both horizontally and vertically in each room. A fresh-water tank with a capacity to store 1,500 gallons of water is replenished daily by a 31gal/hour reverse-osmosis water maker. The eight storage flasks located inside the ballast tanks store around 3,000ft3 of air at a maximum pressure of 250psi. Two Ingersoll-Rand Model H25M air-compressors are used to charge the air flasks. The main power source comes from two 150kW generators, as well as one 40kW backup generator. The engines are mounted on trunnions for horizontal and vertical operation. Navigation equipment on-board the vessel includes a gyro, GPS and RADAR, while the communication equipment includes HF, VHF, INMARSAT and cellular. The steel hull platform of FLIP provides accommodation for 11 researchers and five crew members for up to 30 days. During the flip, everyone has to stand on deck while the deck below gradually becomes a bulkhead, before stepping onto a deck that was the bulkhead just minutes before. 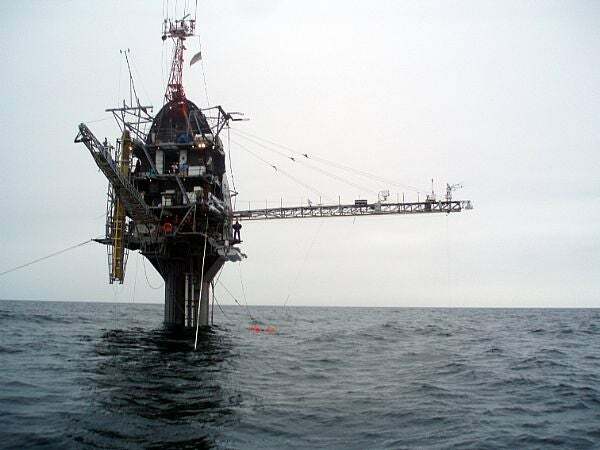 Once the transition has completed, staff have to cope with working five storeys above the ocean, contending with steep stairs, narrow booms and the confined spaces necessary to make FLIP operational. There are two heads (bathrooms) on-board, two showers, but only one that can be used in the vertical and one that can be used in the horizontal position. Northrop Grumman Sperry Marine is a major global provider of navigation solutions, including ARPA / radars, ECDIS, gyrocompass systems, steering systems, speed logs, integrated bridge and control systems. NAVIKNOT Multisensor Speed Log Series has been designed using the most advanced software, offering unlimited flexibility for all vessel types. Sperry Marine offers comprehensive after sales support services, with 15,000 annual service requests for its navigation systems. Services are provided for maintenance, repair, installation and retrofit of most vessel classes.